Tom McCaughey, President, Flagship Trailways (RI), is very proud to share news about Elizabeth (Betty) Luis, a motoroach driver with his company for three years. 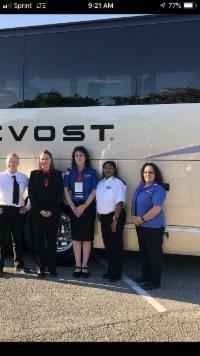 She was eligible to compete in the 2019 UMAEXPO Driver Competition, held during its recent annual meeting in Ft. Lauderdale, Fla.
She was one of just five females eligible to compete and she most impressively, she scored the highest of all drivers on the written test. Betty joined Flagship Trailways in July of 2015. She came from a school bus background and “quickly became one of our very best charter drivers,” Tom Said. Betty also was a participant on a driver round-table discussion at UMA and “did an excellent job there as well”. In order to qualify for the 2019 UMA driver championship competition, just held at the UMA EXPO in Ft. Lauderdale, Fla., drivers must have at least two years of driving with no chargeable accidents and no moving violations on their MVR.